An ‘argument map’ made using a method developed over the past few weeks, producing a variant of established procedures for scraping data from social media for presentation in graph form. This process, now streamlined as far as its very clunky code goes, employs R (specifically the package rtweet) to get thousands or tens of thousands of tweets and process the returned data as nodes and edges lists. It also generates a text file of tweets for semantic mapping as part of a corpus. 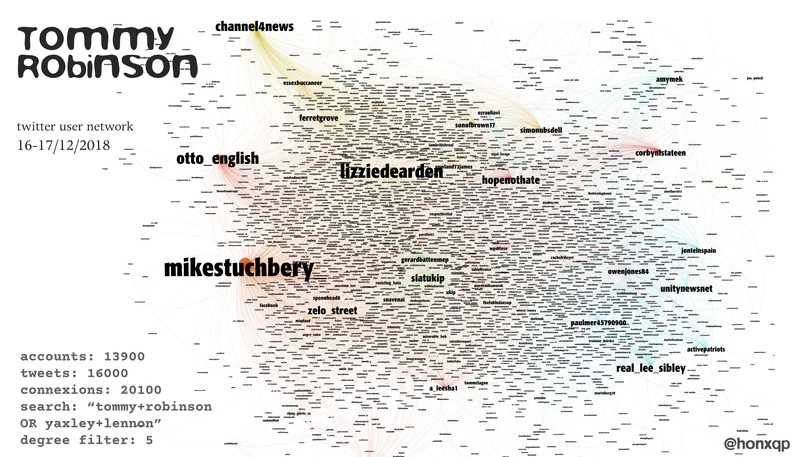 The resulting files are imported into Gephi, & maps generated by adjusting and running algorithms that space, size, and colour nodes and connexions, representing accounts tweeting, or terms tweeted. The output from Gephi is a vector graphic (svg), so no risk of inadequate resolution (this 10mb image is reduced in size to accommodate file size limits, but allows legibility of all nodes with a degree greater than 5*). One purpose for following this method – at this point only up and running for a few days – is visualisation of online argument related to unfolding events. Argument maps ought to yield representations of influential nodes in networks, spontaneous congregation or clustering , competing sallies or campaigns. A further aspiration for this project is is animated argument mapping, indicating the publishing and propagation of messages over time. *the node, or twitter account, or term has at least five connexions to other such nodes recorded in the data.